The Byzantine-Seljuq Wars (Turkish: Bizans-Selçuklu Savaşları) were a series of decisive battles that shifted the balance of power in Asia Minor and Syria from the European Byzantine Empire to the Central AsianSeljuq. Riding from the steppes of Central Asia, the Seljuq replicated tactics practiced by the Huns hundreds of years earlier against a similar Roman opponent but now combining it with new-found Islamic zeal; in many ways, the Seljuq resumed the conquests of the Muslims in the Byzantine–Arab Wars initiated by the Rashidun, Umayyad and Abassid Caliphate in the Levant, North Africa and Asia Minor. Today, the Battle of Manzikert is widely seen as the moment when the Byzantines lost the war against the Turks; however the Byzantine military was of questionable quality before 1071 with regular Turkish incursions overrunning the failing theme system. Even after Manzikert, Byzantine rule over Asia Minor did not end immediately, nor were any heavy concessions levied by the Turks on their opponents – it took another 20 years before the Turks were in control of the entire Anatolian peninsula and not for long either. During the course of the war, the Seljuq Turks and their allies attacked the Fatimid Caliphate of Egypt, capturing Jerusalem and catalyzing the call for the First Crusade. Crusader assistance to the Byzantine Empire was mixed with treachery and looting, although substantial gains were made in the First Crusade. Within a hundred years of Manzikert, the Byzantines had (with Crusader assistance) successfully driven back the Turks from the coasts of Asia Minor and extended their influence right down to Palestine and even Egypt. Later, the Byzantines were unable to extract any more assistance, and the Fourth Crusade even led to the sack of Constantinople. Before the conflict petered out, the Seljuqs managed to take more territory from the weakened Empire of Nicaea until the Sultanate itself was taken over by the Mongols, leading to the rise of the ghazisand the conclusive Byzantine–Ottoman wars. The Battle of Manzikert (Malazgirt, Manavazkert) of 1071 was fought between the Byzantine Empire and the new nomadic conquerors from Central Asia — the Seljuk Sultanate. This battle was decisive in changing the ethnic and the religious outlook of Anatolia, and probably was the reason Crusades from Western Europe began. The emergence of Muslim Arabs from Arabia in the 630s resulted in the rapid loss of Byzantium’s southern provinces (Syria and Egypt) to the Arab Caliphate. Over the next fifty years, under the Umayyad caliphs, the Arabs would launch repeated raids into still-Byzantine Asia Minor, twice threaten the Byzantine capital, Constantinople, with conquest, and outright conquer the Byzantine Exarchate of Africa. The situation did not stabilize until after the failure of the Second Arab Siege of Constantinople in 718, when the Taurus Mountains on the eastern rim of Asia Minor became established as the mutual, heavily fortified and largely depopulated frontier. Under the Abbasid Empire, relations became more normal, with embassies exchanged and even periods of truce, but conflict remained the norm, with almost annual raids and counter-raids, sponsored either by the Abbasid government or by local rulers, well into the 10th century. During the first centuries, the Byzantines were usually on the defensive, and avoided open field battles, preferring to retreat to their fortified strongholds. Only after 740 did they begin to launch counterstrikes of their own, but still the Abbasid Empire was able to retaliate with often massive and destructive invasions of Asia Minor. With the decline and fragmentation of the Abbasid state after 861 and the concurrent strengthening of the Byzantine Empire under the Macedonian dynasty, the tide gradually turned. Over a period of fifty years from ca. 920 to 976, the Byzantines finally broke through the Muslim defences and restored their control over northern Syria and Greater Armenia. 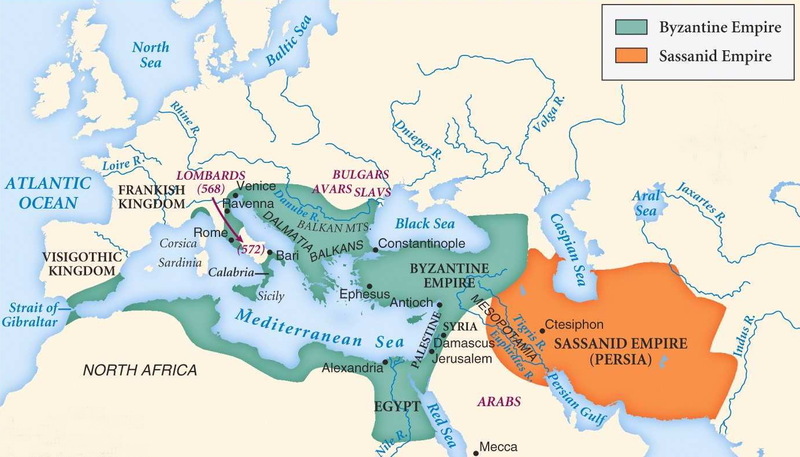 The last century of the Arab-Byzantine wars was dominated by frontier conflicts with the Fatimids in Syria, but the border remained stable until the appearance of a new people, the Seljuk Turks, after 1060. The Arabs also took to the sea, and from the 650s on, the entire Mediterranean Sea became a battleground, with raids and counter-raids being launched against islands and the coastal settlements. Arab raids reached a peak in the 9th and early 10th centuries, after the conquests of Crete, Malta and Sicily, with their fleets reaching the coasts of France and Dalmatia and even the suburbs of Constantinople. In order to check the Arab advance and to recover lost territory, Emperor Heraclius had sent a massive expedition to the Levant in May 636. 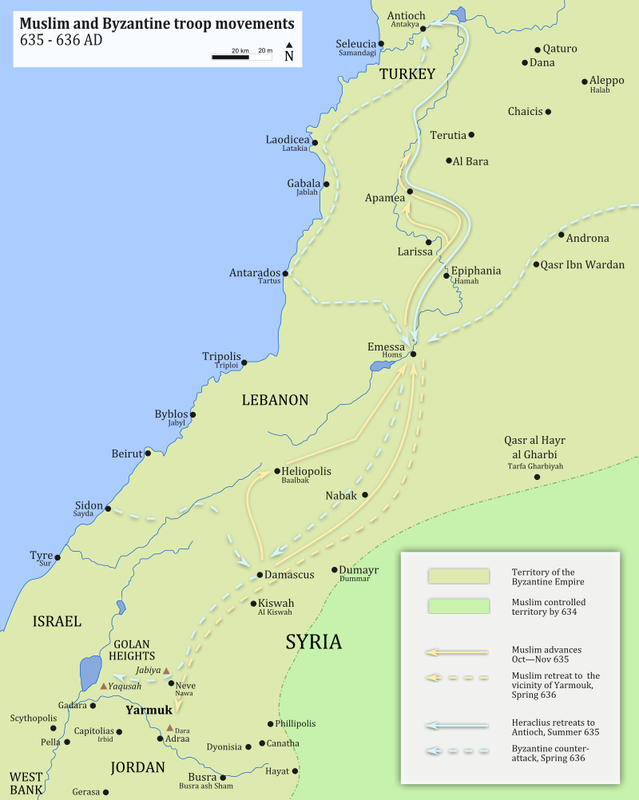 As the Byzantine army approached, the Arabs tactically withdrew from Syria and regrouped all their forces at the Yarmouk plains close to the Arabian Peninsula, where, after being reinforced, they defeated the numerically superior Byzantine army. The battle is considered to be one of Khalid ibn al-Walid’s greatest military victories. It cemented his reputation as one of the greatest tacticians and cavalry commanders in history. Muslim and Byzantine Troop Movements before the battle of Yarmouk. Modern countries indicated. Battle of Yarmouk (20 August 636 CE/11 Rajab 15 H) was fought between the forces of Eastern Roman Empire (Byzantine Empire) and Rashidun Caliphate in Syria near Yarmouk river. 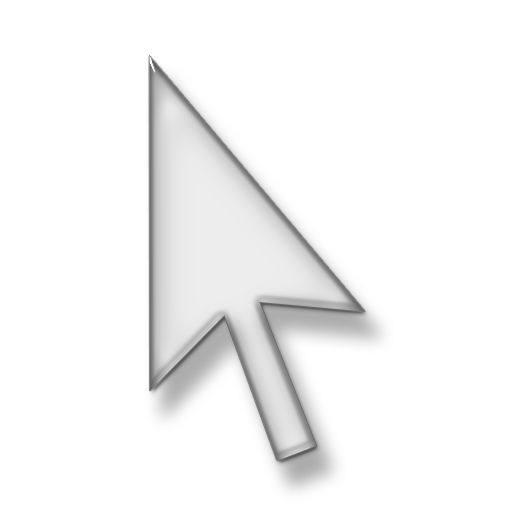 Roman army was doubled the size of Rashidun forces and better equipped, hardened by their losses in 634 CE from early Rashidun advancement. Roman army was led by General Vahan, and Rashidun forces was led by Khalid Ibn Al-Walid. The battle initially commenced by duel between officers of both armies in 15 August 636 CE, but the Rashidun won most of the duel. The moderate battle engagement followed for another 5 days. In the beginning, outnumbered and lightly equipped Rashidun forces were pushed down by Roman with superior number and equipment. Nevertheless the Rashidun forces hold their ground vigorously, emboldened by their faith, Islam. As the battle progressed, Khalid use the advantage of their light cavalry, mobility. While Roman army deployed their heavy cavalry to counter rashidun cavalry movement. But Rashidun light cavalry managed to rout roman cavalry (which is suited for supporting role for the roman army, as the Romans put their best effort at their heavy infantry). Soon roman infantry were outflanked by vigorous rashidun infantrymen in the front and Rashidun light cavalry at their rear. Even though the roman had most of the advantages, the Rashidun forces were able to defeat Roman Army, even Roman general, Vahan was killed in the battle. This defeat bring Damascus to the Rashidun hand once again and forced most of the Roman army retreated to Anatolia. In our previous video, we covered the Byzantine-Sasanian War of 602-628. As that conflict and Initial Muslim Invasion are connected, we decided to make the video on the Battle of Yarmouk that took place in 636 between Byzantine Empire (Vahan) and Rashidun Caliphate (Khalid ibn Al Walid). Although it was the Byzantine-Sasanian War that allowed Islamic Invasion to happen, the battle of Yarmouk was decisive for Roman attempts to defend, and its results are still felt in the region. The Byzantine–Sasanian wars, also known as the Irano-Byzantine wars refers to a series of conflicts between the Eastern Roman (Byzantine) Empire and the Sassanian Empire of Persia. A continuation of the Roman–Persian Wars, the conflict involved several smaller campaigns and peace treaties lasting for years at a time. Following Trajan's successful conquest of Mesopotamia in the 2nd century, the Parthian Empire began to decline. Ctesiphon was overrun by the Romans but the lack of any permanent establishment meant that the Sassanid dynasty filled the power vacuum in the region and started a new Persian Empire in 224. The Sasanians were a more aggressive enemy than their Parthian predecessors and consequently, the Romans found themselves fighting a more dangerous Eastern opponent at a time when the Roman Empire was weakening due to the civil chaos arising from the death of the Roman Emperor Commodus. The Siege of Constantinople in 626 by the Sassanid Persians and Avars, aided by large numbers of allied Slavs, ended in a strategic victory for the Byzantines. The failure of the siege saved the Empire from collapse, and, combined with other victories achieved by Emperor Heraclius (r. 610–641) the previous year and in 627, enabled Byzantium to regain its territories and end the destructive Roman–Persian Wars by enforcing a treaty with borders status quo c. 590. The siege of 626 failed because the Avars did not have the patience or technology to conquer the city. Though the Persians were experts in siege warfare, the walls of Constantinople proved to defend easily against the siege towers and engines, amongst the reasons being that the former could not move their siege equipment to the European side of the Bosphorus (which was heavily guarded), where their Avar and Slavic allies were initially stationed. Furthermore, the Persians and Slavs did not have a strong enough navy to ignore the sea walls and establish a channel of communication. The lack of supplies for the Avars eventually caused them to abandon the siege. 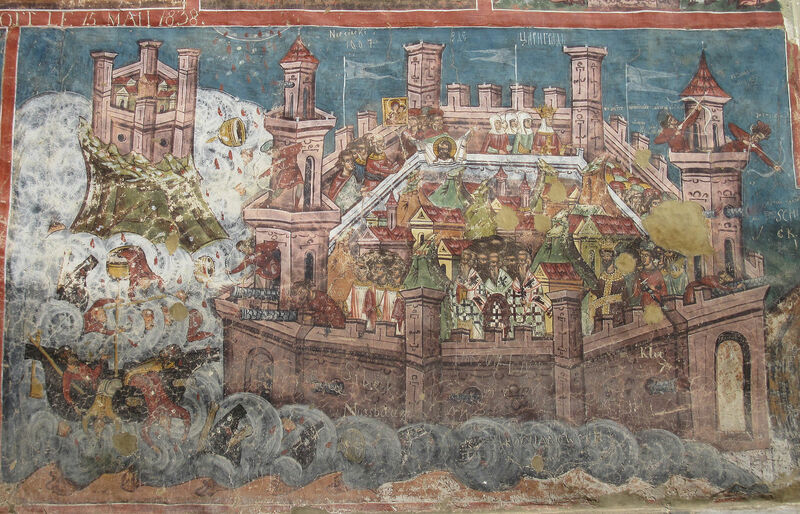 The Siege of Constantinople in 626 depicted on the murals of the Moldovița Monastery, Romania. Depiction of the siege from the Chronicle of Constantine Manasses.